2015 Acura RLX reviews agree that with its premium amenities, refined driving manners and a roomy interior, the RLX should make some waves in the luxury sedan market. With cutting-edge technology like an advanced lane-keeping system and standard all-wheel steering for better handling, the Acura RLX stands apart from other luxury sedans. Test-drive a 2015 Acura RLX in Peoria. You'll find the RLX is quiet and solid. Its suspension ably absorbs road imperfections and its 3.5-liter V6 is strong and smooth. The RLX also be quick on its feet. Throw it in Sport mode and this luxury sedan leaps to the challenge, shifting gears at a higher rpm for quicker acceleration. Even the base 2015 Acura RLX is so well-equipped, it seems wrong to call it the base model. Standard features in the five-seat 2015 Acura RLX include Bluetooth, a 10-speaker audio system, satellite radio, HD Radio, Pandora compatibility, a rearview camera, adaptive cruise control, forward collision warning, lane departure warning, tri-zone automatic climate control, push-button start, a power moonroof, leatherette seats, heated front seats and a leather-wrapped steering wheel that tilts and telescopes. The hybrid version also includes standard all-wheel drive, a heads-up display that projects information on the screen in front of the driver, and 19-inch wheels. It uses the same gasoline V6 as the regular version, supplemented by three electric motors. The RLX hybrid has a 7-speed dual-clutch automatic transmission. Performance-oriented buyers will certainly be interested in the technologically-advanced RLX Sport Hybrid SH-AWD. 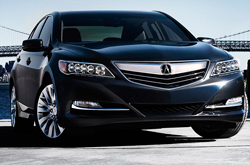 2015 Acura RLX reviews say this could be a real game-changer. TheCarConnection.com says, "The dynamic zeal offered in RLX Sport Hybrid models is unlike anything else in this class." A true five-seater, the RLX offers an exceptional balance of performance, luxury, comfort, and the latest safety technologies. There are other luxury sedans that offer some of these features, but few, if any, offer the complete array of features provided by the RLX, let alone offer it in such a handsome, spacious package. See the 2015 Acura RLX in Peoria at Acura of Peoria.